If you are committed to attending a doctor of physical therapy program, you will need a method to live your life and pay for school. How do you determine which method is the best for you? Take a few minutes to read through these fast facts on physical therapy school loans. They will help you wade through the various choices facing any prospective graduate student. Do you have excellent grades? Do you and your family have financial hardship that qualifies you for aide? Do you only need supplemental money on top of a scholarship? Whatever your circumstances you can zero in on what fits your needs. There are a number of ways to pay for school. Since most of us qualify for more than one option, it is prudent to be familiar with each kind of loan. Not all of them have the same interest rate or penalties if payments are not met. To help know which choice might be your best option, here are five possible loans types that you can consider. As of July 1, 2012, graduate students are not able to qualify for subsidized Stafford loans. Unsubsidized Stafford Loans, Stafford Loans for Graduate Students, are not awarded based on financial needs. Any eligible graduate student can take out this type of Stafford loan. You will be charged interest from the time the loan is disbursed, to the time the loan is repaid in full. The Graduate PLUS Loans is a low fixed interest rate student loan guaranteed by the U.S. Government. The Graduate PLUS loan is not need based like other federal aid. It acts like a private student loan with a fixed rate (see below) however it comes with a federal guarantee. In general, private loans are not federally subsidized or determined on the need of the borrower. They also often require a parent to commit to repay the money if the student fails in their obligation. The interest rates of private loans vary but are typically higher than federal loans. Simple Tuition is a highly regarded website to compare private loan options. Fixed rate private loans and private loans with either fixed or variable rates have riskier repayment structures than federal loan programs. These loan options are advantageous as they allow the borrow to exceed the yearly limits placed on the federal loan programs. They can help the borrower survive the onslaught of both the educational and living expenses taken on during the course of the academic year. 3. 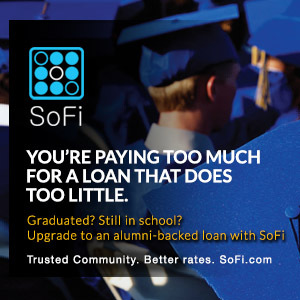 Provided by private lenders such as Sallie Mae , Wells Fargo, and Discover. Items 1-3 above all deal with federal aid. The process for federal aid does not have to be complex. Watch this video which is 1 in a series of 6 that help simplify the process. If you are you ready to attend graduate school, these videos are beneficial. Check out this video to learn how the office of Federal Student Aid provides more than $150 billion in grants, loans, and work-study funds. Visit StudentAid.gov to learn more.